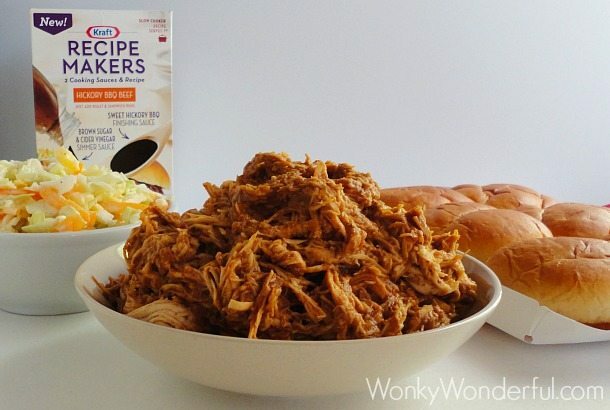 Anyone in need of a quick and easy meal option should check out Kraft Recipe Makers! I’m glad that I was chosen to try the new Kraft Recipe Makers product because it is not something that I would normally buy. I have to say that I truly enjoyed this meal! On those days that you have errands, appointments, school activities, work obligations, house cleaning . . . the list goes on and on. By the time 5 o’clock rolls around you feel like buttering some bread and calling it dinner! Tell me I’m not the only one that has considered a bread and butter dinner!?! How nice would it be to have a hot, satisfying and nutritious meal just waiting for you to arrive home? Kraft Recipe Makers offer seven flavors and you get to choose the cooking method. There are skillet, oven and slow cooker meals. The kit includes two savory sauces that along with your fresh ingredients will make one of three fantastic dishes that are listed on the box. Or you can go off the box (like I did) and create your own Recipe Maker Masterpiece! You can locate Kraft Recipe Makers in your grocery meat department or in the aisle with the sauces and seasoning packets. My local Safeway had them stocked in both areas. 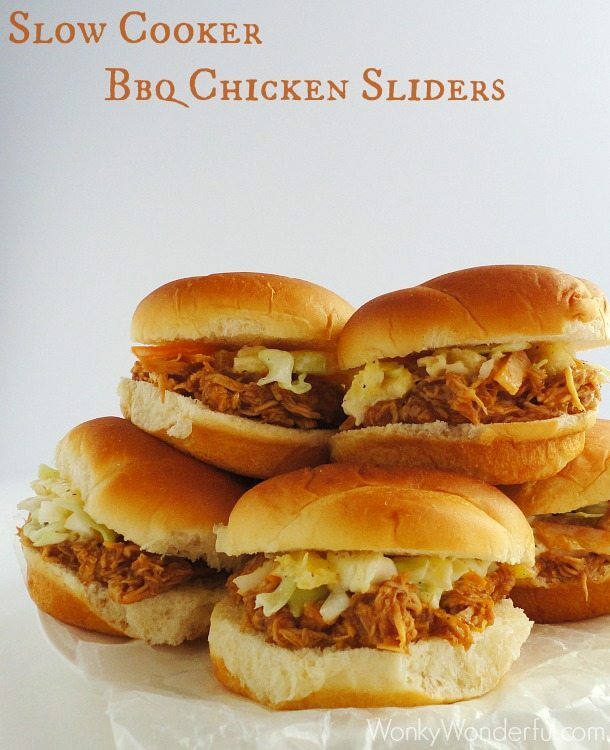 I tried the Hickory Bbq Recipe Maker and decided to make Bbq Chicken Sliders with Pineapple Pepper Slaw. This kit comes with a Brown Sugar & Cider Vinegar Simmer Sauce and a Sweet Hickory Bbq Finishing Sauce. All you need to do is place your preferred meat into the slow cooker, add the simmer sauce, cover, turn it on then run out the door to start your day! Easy-Peasy! Once the chicken is finished cooking, remove from the slow cooker and shred with two forks. 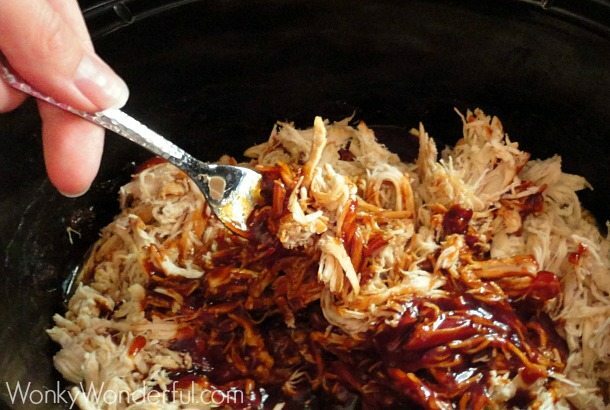 Return it back to the slow cooker and pour the barbeque sauce over the shredded chicken. Cook for another 10-15 minutes. While the chicken is finishing up, now is a good time to whip up some quick Pineapple Pepper Slaw! 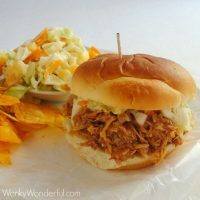 This slaw is a great healthy side dish and also tastes fantastic on top of the bbq chicken sliders. Feel good about skipping the drive-thru and getting a nutritious family dinner on the table! Yep, Mom is a Rockstar! Slice onion into rounds and layer on the bottom of the slow cooker. Rinse chicken breasts and place on top of the onions. Pour the Brown Sugar & Cider Vinegar Simmer Sauce over the chicken. Cover slow cooker and cook on High for 4 hours or Low for 8 hours. Once the chicken is done cooking, transfer to a cutting board and allow to cool for 10 minutes. While chicken is cooling, remove the onions from the slow cooker using a slotted spoon. Discard. Shred chicken with two forks and transfer back into the slow cooker. Add the Sweet Hickory Bbq Finishing Sauce to the shredded chicken and stir. Cover and cook on high for 10-15 minutes. 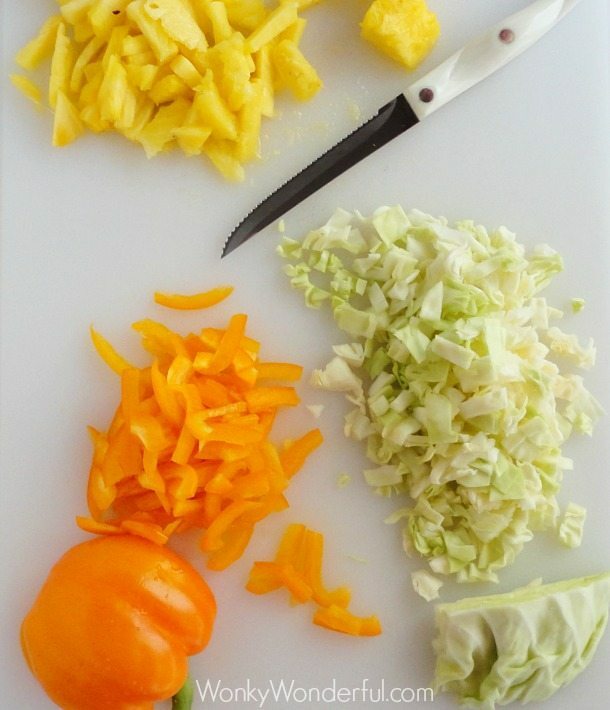 Chop the pineapple, orange bell pepper and cabbage. If the pineapple chunks are extra ripe and juicy, remove some of the excess juices with a paper towel. Mix all ingredients together and place into the refrigerator until the Bbq Chicken is ready. This slaw can also be made ahead of time. Fill the slider buns with a generous helping of mouthwatering Hickory Bbq Chicken and top with some fresh Pineapple Pepper Slaw. Looks like a great weeknight meal option! 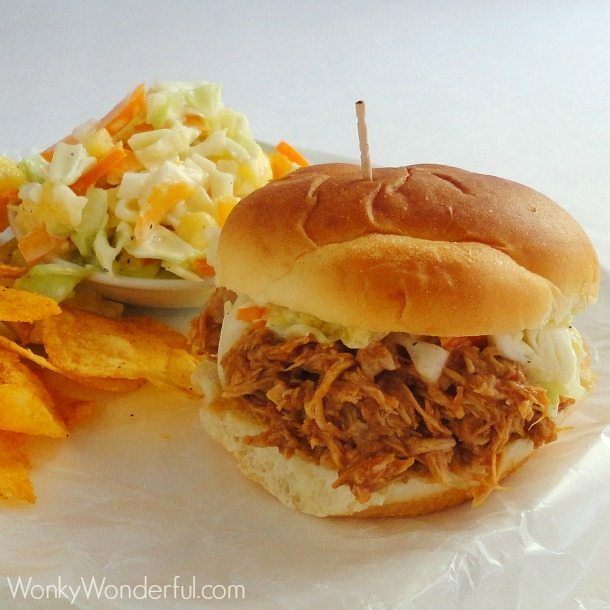 That pineapple pepper slaw looks like a perfect pairing with the rich and saucy bbq pulled chicken! This looks amazing!! Found you over at Time to Sparkle. I am co-hosting Tasty Tuesdays this week and would love for you to link up this recipe. Oh my goodness, I love this! And thanks for letting us know about the Kraft Recipe Makers…I haven’t seen that yet. I have got to try that slaw…sounds like the perfect combination of flavors! Hi Catherine! Yes, it is time to break in that new slow cooker! It is a life saver. Thanks for stopping by, have a lovely evening! I love sliders! These look great! I can’t wait to try them! These look awesome… will need to find that sauce. Thanks Deb! This sauce is really tasty and easy. It is perfect for those days that you just don’t want to deal with mixing up your own seasoning and sauce. Thanks Julie! I’ll definitely be trying the Enchilada Recipe Maker. Have a great week! Thanks Jules! I hope you enjoy! Hi Carolyn! Yes, the Kraft Recipe Makers come with the simmer sauce and bbq finishing sauce. You do use both sauces. 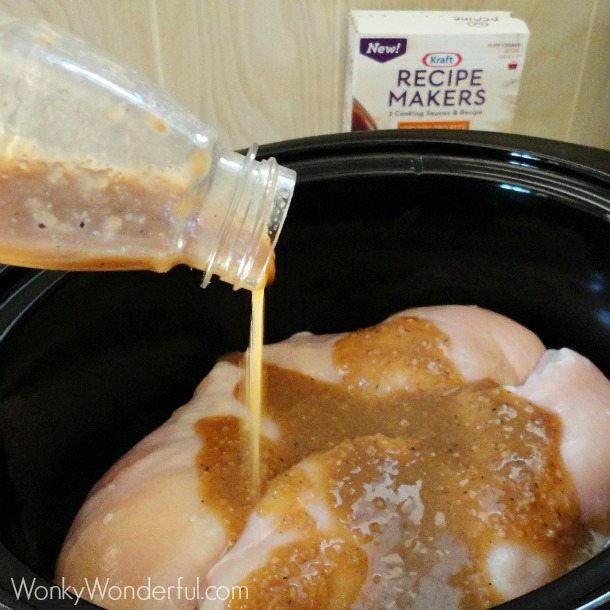 Pour the simmer sauce over the raw chicken and slow cook. When the chicken is done, that is when you will want to mix in the finishing bbq sauce. Hope that helps!